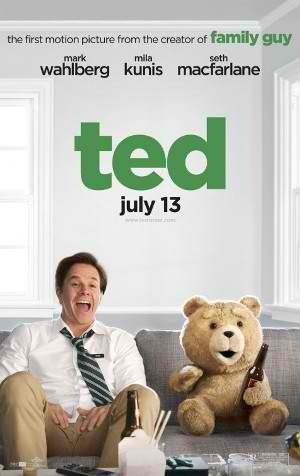 "Ted" (stylized as "ted") at first glance may look like a film that people should avoid. It seems that the basic plot, in which a teddy bear miraculously becomes alive, is something that is used occasionally in Hollywood (well, not a teddy bear in particular but animals or things humanized). And the results are usually not on the positive side. But what sets apart "Ted" from the usual hodge-podge is one single thing and it is its R-18 theme - it's that simple really. Even though one of its main characters is a toy designed for kids, this isn't a film for them. Put simply, "Ted" is one of the funniest movies this year because it dares to do things others in this genre haven't or simply couldn't. In 1985, a young John Bennett is a lonely kid. It seems as though that every kid on the block, even the losers, don't want to be with him. When Christmas that year arrives, John receives a teddy bear from his dad whom he names Teddy. John in an inst a falling star occurs, John also wishes Teddy to be real. His wish is granted and Teddy becomes alive. In 2012, we find out that Teddy (Seth MacFarlane) and John are still best friends albeit both are older. Teddy is not an innocent teddy bear anymore and John struggling to find a better paying job although he has a 4-year relationship with a girl named Lori (Mila Kunis). When John ultimately chooses to do things with Teddy than Lori, she gives him an ultimatum - be with her and leave Teddy or she will leave him behind. "Ted" is a win not only because of its great humor with lines upon lines that did not fail to laugh out loud but it also contains characters are rather compelling. To be honest, seeing a teddy bear spurning out line after line of obscene jokes and manners is odd yet refreshing. If you watch "Family Guy" the it's rather off-putting to hear that familiar Peter Griffin and Bryan voice-over but ultimately, Seth MacFarlane knows his stuff and he delivers a marvelous performance as Teddy. It's like the game "Conker's Bad Fur Day" and everyone knows how legendary that game was. But not to be outclassed is Mark Wahlberg. He certainly has his own brand of humor and once again, like all of his recent comedic tries, it seems he is the perfect cog to cap things off. The only thing that could be improved is the eventual story of "Ted". The introduction was nice actually but everything else feels familiar. The last portion in particular where Teddy is "toy-napped" is rather forced. In summary though, even with the lackluster story, its shortcomings is forgivable and forgettable once you start laughing. "Ted" is a fun-filled film that most won't forget soon.